Herald: Will big fat weddings lose some weight in Goa? Will big fat weddings lose some weight in Goa? feet. After all, everyone counts on whose wedding will be the best. Each one tries to be under the limelight; five starred deco, set-up, dressing, catering, filming and extra traditional activities like mehendi, haldi, sangeet, roce, rehearsal dinners and it goes on… how much money is spent on all of these? Wouldn’t it be a better option if an equivalent expenditure goes on wedding and then the future plans, because at the end you are going to marry your partner and not the rest of the world, so why the trouble of goose-bumps when your cake doesn’t have that perfect shape, or your deco lights don’t dazzle like the stars? According to online American reports, a lot of couples refrain from spending a large amount on their wedding day. Instead they ask their ‘to be invited guests’ to buy them wedding materials and services in place of gifts by making a list of things they require for the wedding. In this way, the couple spends less, and their gifts are more sensible than having a house full of bouquets that fade away later. Another way of saving money during weddings is the tradition that some British follow of having food stalls and where the guests can buy their own food, with only a complimentary beverage and snacks from the couple. Interestingly, new generation Goans are falling into the trap of pushing the wedding expense envelope further. In the last two years from 2017 to 2019, weddings, on an average, have cost 10 to 12 Lakhs, with some large scale ones going way beyond. In fact in some weddings the flowers alone cost RS 10 lakh plus. However, 10% of people still opt for the wedding saving plan in Goa if there is no family pressure of having a better wedding than one of your friends. Unfortunately in Goa, though many decide on having a well planned budget wedding, most end up in spending tremendously after society pressure, but of course no one would cross more than 15 Lakhs. 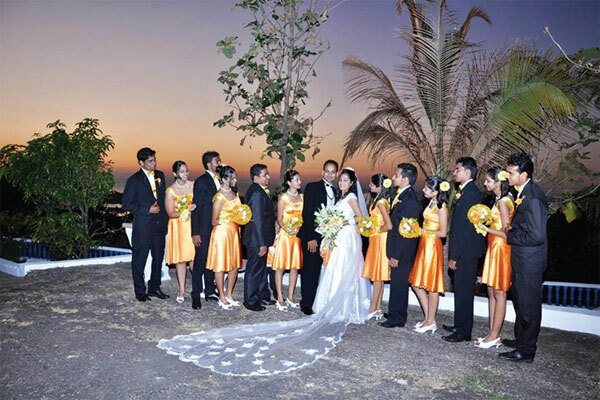 Apart from the local weddings, Goa is a great place for destination weddings and most of these kinds of weddings are over budget with thousands of guests. With all the drama happening in the background, the plus point is that it is the easiest way for designers, wedding planners, event managers, and brands to make money and advertise their brand identity. Whenever it comes to inviting guests, having big crowds for wedding are always a personal choice. You may want to invite your office-mate and his mother and his mother’s sister, and his girlfriend, or you may only want to invite your office-mate to be the guests at your wedding. According to WoknRoll partner Asheen Lobo, Today’s generation would love to have a small wedding with close friends and family on a Beach or abroad, that’s the current building trend. But, unfortunately they go through The Big Fat wedding due the family and society. The “what will they say”, is the question that creates the whole problem. Marketing Professional Shimonti Gupta understands that both the trends are important through all the weddings she attended where there is a huge amount spent for a glamorous wedding and where the money is used wisely for a meaningful wedding. “We have wise young ones who would rather travel or buy something important to them. And then you have the young ones who are inspired by the expensive weddings around the world and want to recreate a celebrity wedding; there is also a third kind, who are very balanced. They have a small boutique wedding and also engage in buying a car or a home,” she expresses. Many couples often plan on saving their money for a great holiday together than on a wedding ceremony, while some like treating the special day as a memorable one. As most argue on whether great holidays or future savings are important, Shimonti adds, “Very tricky, I think both are important, because after all in our busy job life, we need a vacation spent well, in order to have a fresh start for the future planning.” Nikita agrees that a great holiday is important as it makes memories which one can cherish for a lifetime. “It also brings the couple together and helps them spend some quality and romantic time,” she says.